The automatic release is an essential skill in every good rider’s toolbox. The use of it promotes a soft elastic connection with the mouth that follows the horse’s neck (bascule) over a jump. Additionally, the automatic release or following arms, illustrates the independence of the rider’s seat and legs. In this topic Jim Hagman, founder and head coach of Elvenstar (one of the West Coast’s most successful show stables), presents his formula for introducing and perfecting this, the most advanced release. Joining Jim as demonstrator is his superstar student, Sydney Hutchins, whose mastery of the automatic release was evident recently during her two giant wins - the 2014 Platinum Performance/USEF Show Jumping Talent Search Finals West and the 2014 ASPCA Maclay Regionals West! Click here to view the other videos in Jim's Automatic Release series. Equine activities can be hazardous and may subject participants to injury. 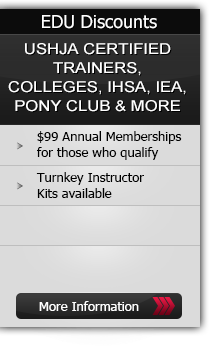 Neither Equestrian Coach, LLC nor James Hagman assume liability for your activities. This program provides general instructions and techniques that may not be suitable for everyone. No warranty is given regarding suitability of these instructions to the viewer.